Born: at Moorhurst, Holmwood, Surrey 27 December 1861. Died 22 October 1954 at Stoneycrest Nursing Home, Hindhead, Surrey. He is buried at Holy Trinity Churchyard, Ebernoe, Sussex. Son of: Admiral Sir Leopold Heath KCB RN and Lady Mary Emma Marsh. 2. Marion Emma Crofton (nee Heath, 1856-1949) who married Alfred Fox Cotton and then Richard Martin Crofton. 3. Maj Gen Frederick Crofton Heath-Caldwell (1858-1945) who married Constance Mary Helsham Heath-Caldwell (nee Helsham-Jones, 1869-1957). 5. Ada Randolf Broadwood (nee Heath, 1860-1957) who married HJT Broadwood (1856-1911). 6. Major-General Sir Gerard Moore Heath (1863-1929) who married Mary Egerton. Leopold married: Elizabeth Catherine Simson (18??-1951). 1. 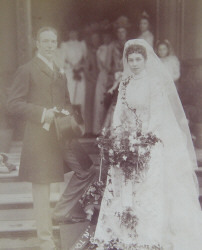 Madeline Marion de Salis (nee Heath, 1892-1978) who married Capt Rodolph de Salis (1890-1972). 1. Entry in the book "Records of the Heath Family Vol 1" by George Heath, 1913. 2. Entry in the book "Records of the Heath Family Vol 2" by George Heath, 1920. 3. Mention in the book "The Kaiser" by Annika Mombauer and Wilhelm Deist, Chaper 7, by Matthew S Seligmann, published 2003. 4. Mention in the book "Spies in Uniform" by Matthew S. Seligmann , published 2006. Herbert Leopold Heath was born at Moorhurst, Holmwood, Surrey, Dec. 27th, 1861.After the usual home education by means of governesses, he went to Brighton College at the age of 10 ½, remaining there some 18 months. The idea of joining the Royal Navy was, for some reason, repugnant, although it was several times suggested. Herbert was then taken to Charterhouse School at Godalming, with a view to preparing him for a University education, for some unknown reason, the boy took a violent dislike to the look of Charterhouse, and announced that he would rather enter the Navy. There was little time to spare for preparation, but his father took his mathematics in hand, his mother the languages, drawing, etc., and a very excellent private tutor, Mr. Hook, of Dorking, carried out his instruction in other subjects, with the result that Herbert passed into the Britannia 6th of his batch. The interval between passing in and joining the Britannia was spent with his brother Gerard at the house of some old friends (Mm. Courtois) at Versailles, where he was thoroughly grounded in the French language. In June, 1874, Herbert "put on his buttons," and joined H.M.S. Britannia, where in due cours, he became chief captain of his term, gaining a prize dirk on leaving, also the prize for physics and scripture. He was not particularly good at games, but won the sculling and sailing races for his term on two occasions. On leaving the Britannia, midsummer, 1876, he was appointed to H.M.S. Shah, about to be commissioned as Adm.de Horsey's Flagship on the Pacific Station. There appeared to be some suspicion as to the vessel's stability, for on the day following the commission, some wag put up a large notice to the effect that "Letter for H.M.S. Captain can be posted here," it being remembered that the Captain had foundered in the Bay of Biscay with all hands during the previous winter. Commissioning was somewhat rough work in those days, and it is noted the Herbert was laid up for two or three days, as a result of too much attention to new bread, ginger beer and raw rum. Owing to defective machinery, the Shah did not finally sail till just before Xmas. The Shah's commission was famous for her engagement with the Peruvian rebel ironclad Huascar, after a chase of four days, it being Herbert's good fortune to sight the chase during his afternoon's watch on the crosstrees. The engagement lasted till dark, when the Huascar escaped, and surrendered next morning to her own government. As a result of this engagement, it was decided to replace the Shah (a composite vessel) by an ironclad, the Triumph being sent out, and all the midshipmen from Shah were transferred to her. Life in the Pacific seems to have been full of fun, and adventures plentiful, and at each port there appears to have been at least one particularly charming young lady. Amongst other places of special interest visits were paid to Honolulu, Pitcairn, and the Galapagos Islands. On reaching 19 years of age, Herbert passed in seamanship for the rank of Sub-Lieutenant, and was sent home, via Panama rail and Royal Mail S., as an acting Sub-Lieutenant. A growing boy, after five years; absence, is naturally somewhat too big for the clothes in which he started, and it is said that on being met by his younger brother at the front door, he was promptly ordered round to the back premises for "bread and cheese," being mistaken for a common tramp. On completing the various examinations, Herbert was appointed Sub-Lieutenant to H.M.S. Northampton, flagship of Sir E. Commerell on the N. American and W. Indian Station. The commission was uneventful, except for the ship twice getting on shore in Bermuda, and for a month or two there seemed to be a chance of war with Russia over the Penjdeh incident; it is sufficient to say that every Russian vessel was successfully shadowed by a British vessel of superior force. Promotion to Lieutenant came in due course, and after serving for one year in the rank, Lieutenant Heath was sent home by Mail Steamer to qualify for Torpedo Lieutenant. The Mail Steamer Hanoverian was wrecked off Cape Race during a thick fog, all hand were saved, but the baggage and cargo was lost, Lieutenant Heath, together with some other officers taking passage, received a letter of appreciation from their Lordships for their conduct on this occasion. On completion of the Torpedo course, Lieutenant Heath was lent to the Government of Victoria as Torpedo Officer, under a three years engagement, terminating in January, 1891. 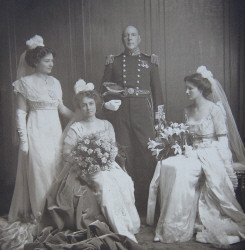 Being then 29 years of age, he married at Melbourne, January 21st, 1891, Elizabeth Catherine, daughter of Colin Simson, Esq., of Mungadel, Hay, N.S.W., and returned to England immediately afterwards. His next service was as Torpedo-Lieutenant of H.M.S. Nile, newly commissioned for the Mediterranean under Captain Noel, one of the smartest Captains of his day. After one year's service, Lieutenant Heath was transferred to H.M.S. Victoria, flagship of Sir George Tryon, and was acting as Commander of that vessel when she was rammed by the Camperdown, June 23rd, 1893. The survivors were sent home in H.M.S. Triumph, and after a certain amount of leave, the majority of the officers commissioned H.M.S. Ramillies, to take the place of the Victoria; Lieutenant Heath again going as Torpedo-Lieutenant. He was promoted to Commander in 1896, and after a short spell was appointed Commander of the Battleship Camperdown in the Mediterranean a good portion of the commission being spent in Cretan waters during the troubles there prevailing, which ended in a massacre of a small body of the Highland Light Infantry, and the final occupation of Candia by British troops. Camperdown was paid off in 1899, and Commander Heath was, shortly after, appointed to H.M.S. Powerful, then lying in Simons Bay, the majority of officers and men being shut up in Ladysmith. Commander Heath was not landed on active service, and came home in H.M.S. Powerful early in 1900, and shortly afterwards was appointed to the Naval Intelligence Division of the Admiralty, when he was promoted to Captain as head of the War Division. As Captain he commanded H.M.S. Vulcan, then H.M.S. Repulse, and finally H.M.S. Lancaster, the latter vessel being selected as one of the escorting cruisers during His late Majesty's cruise in the Mediterranean, including the return visit of King Alfonso. Captain Heath was awarded the Victorian Order, and Spanish Naval Order of Merit. After the two years commission of H.M.S. Lancaster, Captain Heath was appointed Naval Attaché to the Courts of Berlin, Copenhagen, and The Hague, during which time the competition in naval armaments became fully developed, and Germany's race for sea power was started in earnest. Captain Heath served in this post for two years, and was awarded the Order of the Red Eagle by the Emperor William. On his return home in August, 1910, he was appointed to the command of H.M.S. Superb in the 1st Division of the Home Fleet, and was promoted to Rear-Admiral September, 1911, whilst in command of that vessel, receiving five months later the appointment of Admiral-Superintendent of Portsmouth Dockyard. ADMIRAL SIR HERBERT LEOPOLD HEATH, K.C.B., M.V.O. Certain episodes in his earl career are worthy of notice. During the voyage of H.M.S. Shah in 1876, she called in at Montevideo, where H.M.S. Volage was then lying. Her Captain challenged the Captain of the Shah to a sailing race as far as the Straits of Magellan, which was accepted. Six hours after making sail the Shah lost sight of the Volage astern. Thus ended the race. His first appointment as Sub-Lieutenant was to the Training Brig Seaflower, where he spent the whole of the summer of 1882. In 1884 he was shipwrecked in an Allan Line Steamer on his way home from H.M.S. Northampton, the ship being a total loss. He had another fortunate escape whilst looking for a lost torpedo in Melbourne Harbour, the diver not being anxious to continue the search. After getting into the diving dress, he went down, got hold of the torpedo, and put a line round it, and then something went wrong with the gear. He just had sense to make the signal to be pulled up, but was unconscious on reaching the surface. He was Aide-de-camp to His Late Majesty King Edward VII, and to His Majesty King George V., and took part in the Coronation ceremony of the latter Sovereign as A.D.C. He held the appointment of Admiral Superintendent at Portsmouth Dockyard till October, 1915, when he proceeded to Scapa and hoisted his flag in H.M.S. Minotaur as Rear Admiral Commanding the then 7th Cruiser Squadron. In due course, the 7th and 2nd Cruiser Squadrons were amalgamated, and Admiral Heath took command of the newly constituted 2nd Cruiser Squadron; the whole of the Squadron took part in the battle of Jutland (awarded C.B. and mentioned in despatches). In September, 1916, he was given command of the 3rd Battle Squadron with the acting rank of Vice-Admiral, was appointed Second Sea Lord and Head of personnel on the Board of Admiralty, which position he retained until the end of March, 1919, when he was appointed Commander-in-Chief, Coast of Scotland. British. K.C.B., M.V.O., Coronation Medal, South African Medal. Foreign. Spanish Order of Merit, Grecian Order of the Redeemer, Prussian Order of the Red Eagle, Japanese Order of the Rising Sun, French Commander of the Legion of Honour, and Russian Order of St.Stanislaus, American Distinguished Service Medal.